The choice of tile options with our solid roof solution means we have options that compliment almost any home. Our standard lightweight tile option is available in four colour choices with hip sections to match, the interlocking nature of this product make this the fitters favourite as it’s quicker installation times and low pitch capabilities prove this is a very versatile product. Aesthetically the Tapco slate offers consumers a perfect match for existing slate house roofsFor centuries, slate roofing has been desired for its durability and beauty. With authentic surfaces and edges, TapcoSlate highlights the handsome character of slate, at the same time enhancing roof performance through innovative design. Unlike natural slate, TapcoSlate won’t break or delaminate and comes with a 40-year Warranty. A flat, precision manufactured, recycled polymer, lightweight roof tile with excellent green credentials. It has a low profile chamfered front leading edge which is aesthetically pleasing in all aspects, this sits comfortably between a traditional slate and ‘modern’ roof tile proving a very versatile option to installers. It is extremely simple to fix yet performs exceptionally, locking into adjacent tiles to form a fully integrated roof covering. It is suitable for all buildings including conservatory replacements due to the light weight design and low pitch capability. Lightweight tiles perform to roof pitches as low as 12.5 degrees. The TapcoSlate highlights the handsome character of slate, at the same time enhancing roof performance through design. The tile is a mixture of limestone and PVC and provides a lightweight alternative to traditional slate which is easy to cut and work with on site without compromising performance. Unlike natural slate TapcoSlate won’t break or delaminate. The slates are created with moulds cast from real slate and colour-through design and UV stabilisation ensure “stay true” richness for traditional colours such as Pewter Grey and Terracotta red and unique selections such as Chestnut Brown and Grey/Black blended tiles. The TapcoSlate gives you an authentic and attractive look and carries a 40 year warranty, a perfect match to any traditional slate roof. 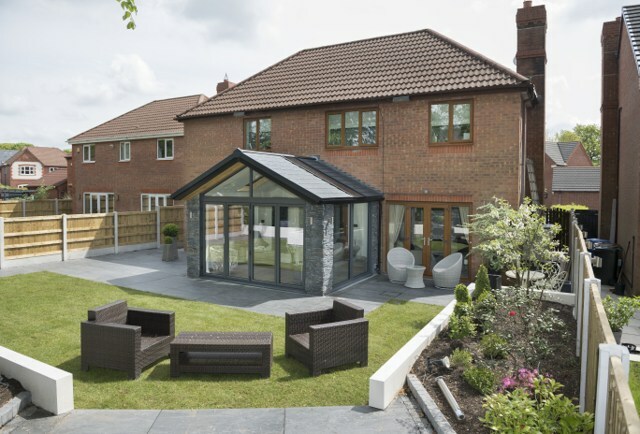 Highly insulated roofs for conservatory roof replacements, sunrooms or home extensions. Products specifically designed for conservatory roof replacements.